This week, I’d like to introduce another one of our newest games that is in stores now, FitzIt! 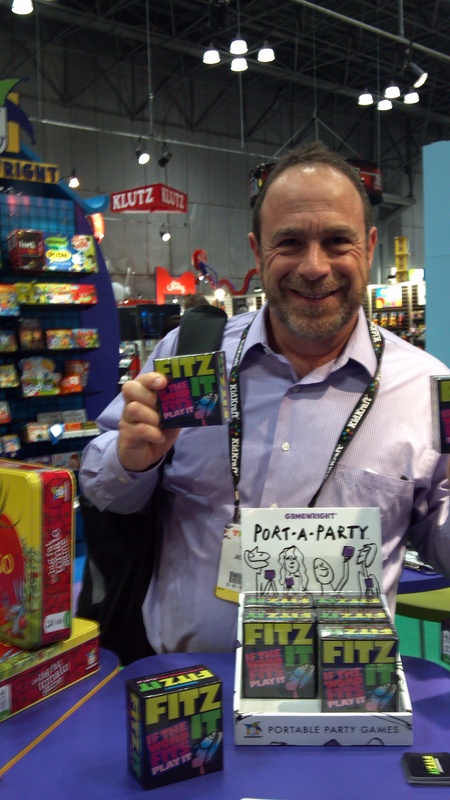 FitzIt is the latest in our line of Port-a-Party games, a fun line of travel-friendly games that are great for the whole family. You are probably already familiar with the other games in the line that debuted last year, Joe Name It and Who Would Win. Who better to introduce FitzIt than the inventor himself? I recently spoke with Jack Degnan to find out more about this hot new pocket-sized game. What inspired you to create the game FitzIt? I had created and had published a game called “IT Fits” in 2008. It was fun but the game design was a bit clunky and complicated. I wanted to simplify the game. I’ve always liked crossword-style games like Quirkle and Scrabble. I don’t recall anyone ever making a crossword-style game using tiles with descriptions (instead of letters of symbols), so I thought I’d be the first. 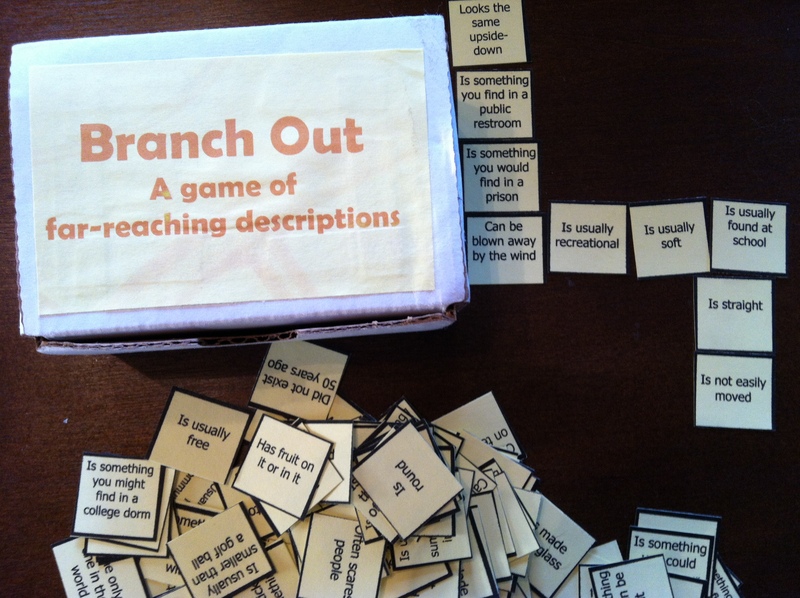 At first, I called the game “Branch Out” but FitzIt is a much better name. For those unfamiliar with the game, can you describe the basic mechanics? FitzIt is a very simple game for 2 or more players. It can be played in teams. Teams have fifteen small square cards that each contain a description like: “Something found in a prison”. Five cards are held at a time. On each turn, players or teams try to get rid of their cards by attaching as many cards as possible to the crossword-style shared grid and then naming an object that fits all the cards in the row they just formed. The first player or team to get rid of all their 15 cards wins. What kind of reaction do you get from people that play FitzIt for the first time? Players have always responded well to the concept. Over and over again I watch players get lost in the thrill of the game. The meat of FitzIt is really in the debates that occur when a player or team must justify why their card fits their stated object. Of course the rules describe how to resolve the debates. I actually prefer it in teams or pairs but it is also a fun 2-player game. How did you come up with all of the words for the game? Were they completely random, or did you have ideas about sets of words that could fit together? I began looking at all sorts of objects and thinking of the traits that describe those objects. Through playtests, some of the cards/traits were obviously a bit more difficult and obscure than others so most of those were eliminated before I sent the prototype in. Have you invented other games, and/or are there more in the works that you can talk about? Any more Port-a-Party games? 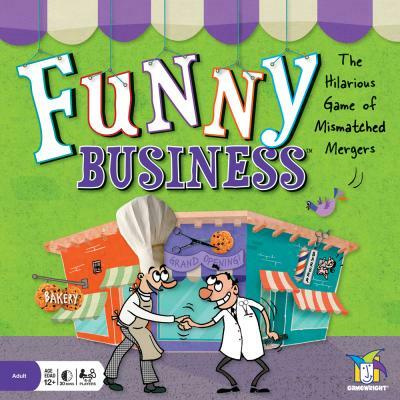 I have four other games already on the market, one was with Gamewright: Funny Business. I also have three additional games scheduled to be released this year, 2012. I do have other games that fit the Port-a-Party genre but none have been published yet. By the way, I love that phrase: Port-a-Party. Makes me chuckle every time. And I think it’s a great idea – simple, cute, small, easy to carry around, hours of fun in the palm of your hand. Yes, I have more games in the works and they are….. oops I just forgot. What are your top five favorite games that are on the market? Do you have favorite Gamewright games? I like games that inspire a bit of creativity and I like word games. I also like light strategy games. Some of my favorite games are: Balderdash, Taboo, ImagineIff, Backgammon and Scrabble. I am a big fan of Gamewright games. I own: Sounds Like A Plan, Tiki Topple, Hit or Miss, In a Pickle, Forbidden Island, City Square Off, FlipOut, Rory’s Story Cubes and of course…. Funny Business. All of these games get played over and over again in my home and they have brought much joy and laughter to me, my family, and my friends over the years. If you were to give advice to others on how to invent a game, what would it be? Make sure your game hasn’t already been done a zillion times already. A good game isn’t interesting…. a good game is FUN. I’ve been told the games that sell the best are the ones with simple rules. Playtest a lot! Oh yeah… and be careful with Superglue… it can be a nightmare. 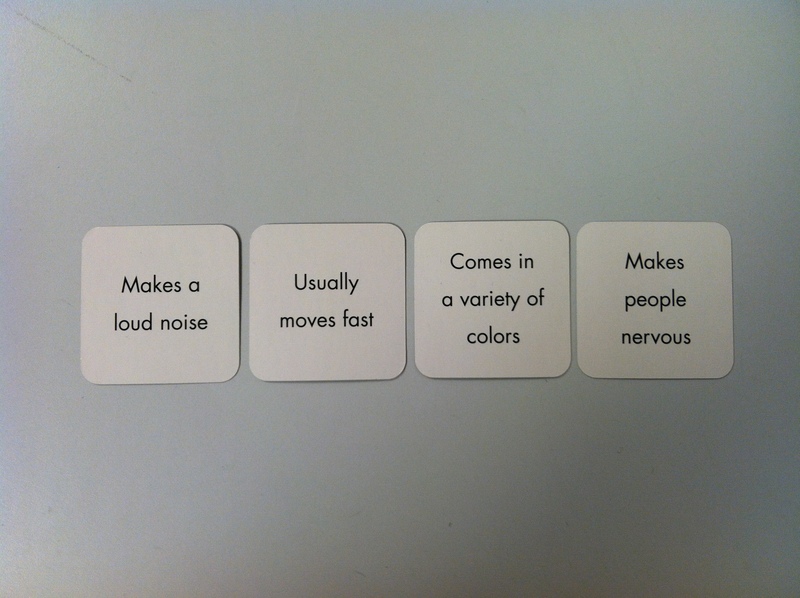 Here is an example of a first set of cards played – It’s a motorcycle! To win your very own copy of FitzIt, take the next turn by choosing from the cards below to add to the grid above. You must use at least one card from the list and add them above or below one of the cards already in play. Leave in the comments which cards you’re playing, along with the name of an object that the descriptions fit! We’ll choose the best answer next Monday after midnight EST. Good luck! This entry was posted in FitzIt, Inventors, Joe Name It, Port-a-Party, Who Would Win. Bookmark the permalink. Great idea for a game, sounds like a ton of fun! I would use “made with fabric,” usually taken on a camping trip,” “can be rolled up” and “used daily” underneath “comes in a variety of colors.” The answer is sleeping bag. I’ll take all five of the new cards under “Comes in a variety of colors” and go with “towel”. Towels usually hang, are made of fabric, come in a variety of colors, are taken on camping trips, can be rolled up and are used daily. Great idea for a game, by the way. Very cool. Usually Hangs over Makes People Nervous – Pinata! 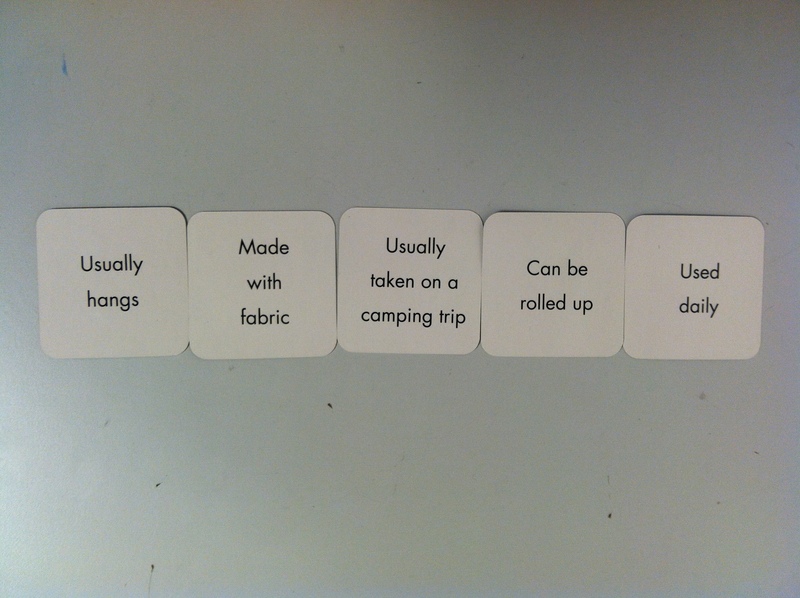 I’d like to add “Usually taken on a camping trip” to your above combination for the following answer: Bears! lol… Loud noise: check. Colours: black, brown, white. Moves fast: check. Makes people nervous: Indeed!